Every once in a while, I run into something that in all my years of using Autodesk Inventor, I've never seen before. And I just recently ran into one of those cases. I encountered an Inventor installation that was doing something I had never seen before. Using Inventor for nearly 15 years, this one was totally new. On this particular machine, threads couldn't be added. 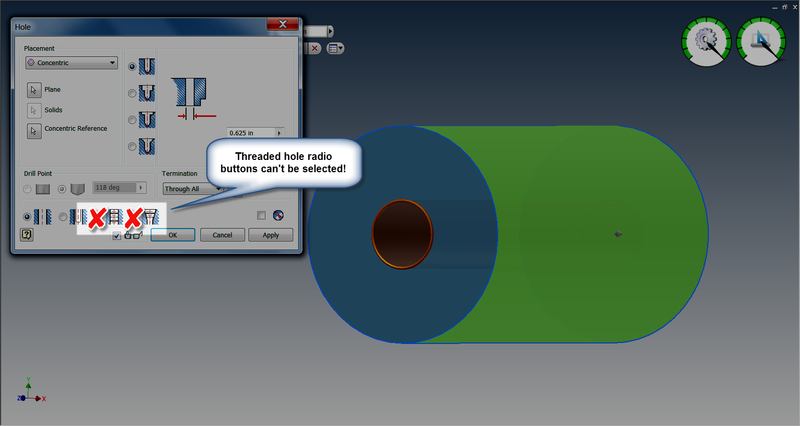 The hole tool would start just fine, but when I tried to select threaded holes, nothing happened. The radio button wouldn't select. It was like the button wasn't there. Not having seen this before, I do what any self respecting geek would do. I fired up Google and began a search! Fortunately, my search paid off, and I found a link with a solution! I can't take the credit for finding the solution, but what I can do, is share what I've discovered! Credit goes to JD Mather who put up the solution originally! The first thing I do, is shut down Inventor. I don't think this is necessary, but it's a good practice, and I don't take chances. 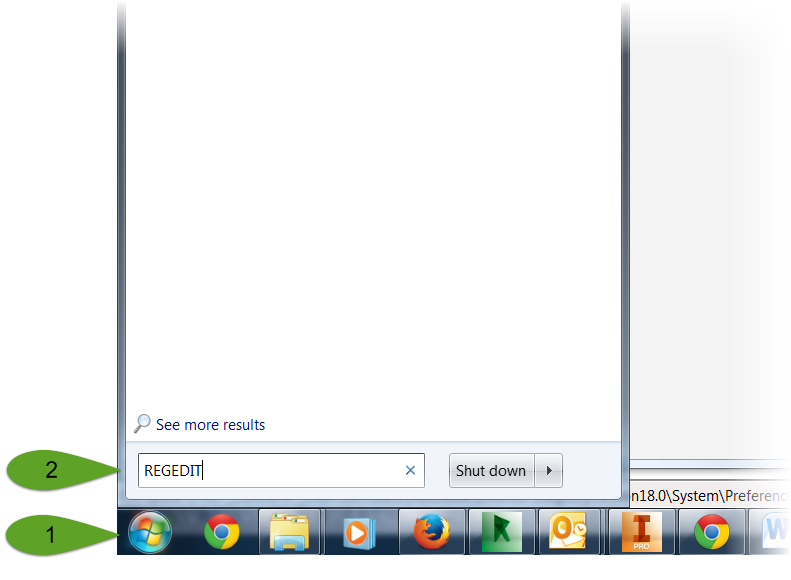 Next type REGEDIT in the Windows Search box. 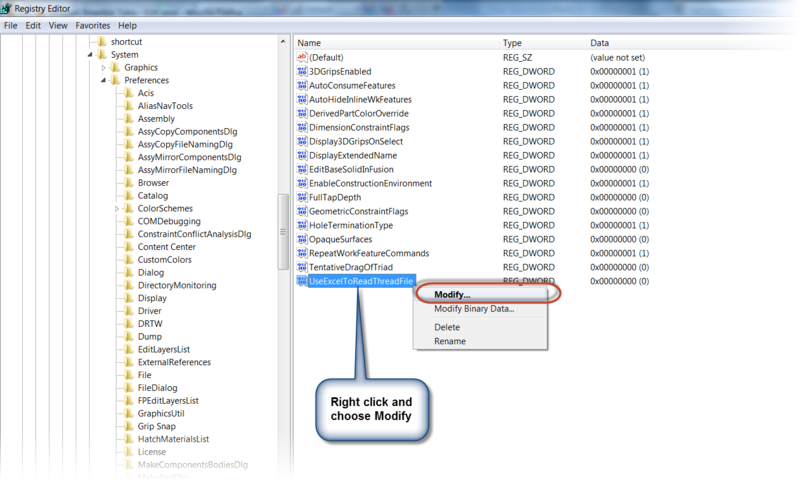 This opens the Windows Registry Editor. 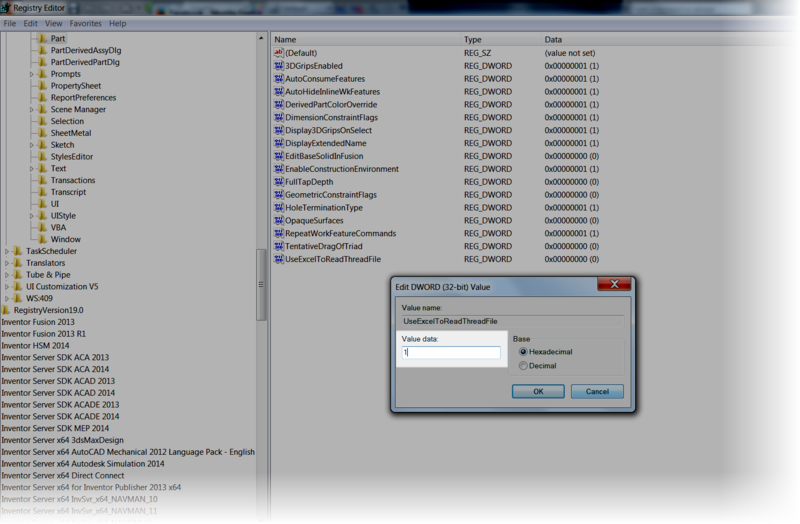 Once this value is changed, close the Registry Editor, and start up Inventor. After that was done, the computer could place threads just fine! This was really an odd one, I've never seen it, but feel free to drop a comment if you have. I'm curious to see if this has shown up for anyone else out there! I'd love to say that I came up with this solution all on my own. But I didn't. Thanks again to JDMather. He placed a great update at the following link on the Autodesk Discussion Group. All I can say is that I updated some of the info, and added some updated images. I definitely have to give credit where credit is due! Thank You for posting. I am facing the same problem and shall rectify with your proposed solution and help. I'm glad the tip helped! Happy Inventing! Jonathan, I just experienced this issue... I was able to resolve using your research. Quite welcome! I hope this solution helped! Thank you! It worked for me! I'm glad that tip helped you out! It's always frustrating when you can't place threads! it happened to me just now, yesterday I could do threads, and today, nada. Any idea of why this could have happened? Neko, I've actually had to fix four machines at work today that did the exact same thing. I'm going to have to "bump" this post it seems! I can't say for sure what caused the issue. But my guess is that a Windows update tripped the registry key. Can I ask you what version of Inventor your using? We're on 2015 over here. I'm curious what versions are being affected. Funny thing! Not 5 minutes after I posted this I found a post from Mark Lancaster on my LinkedIn feed. 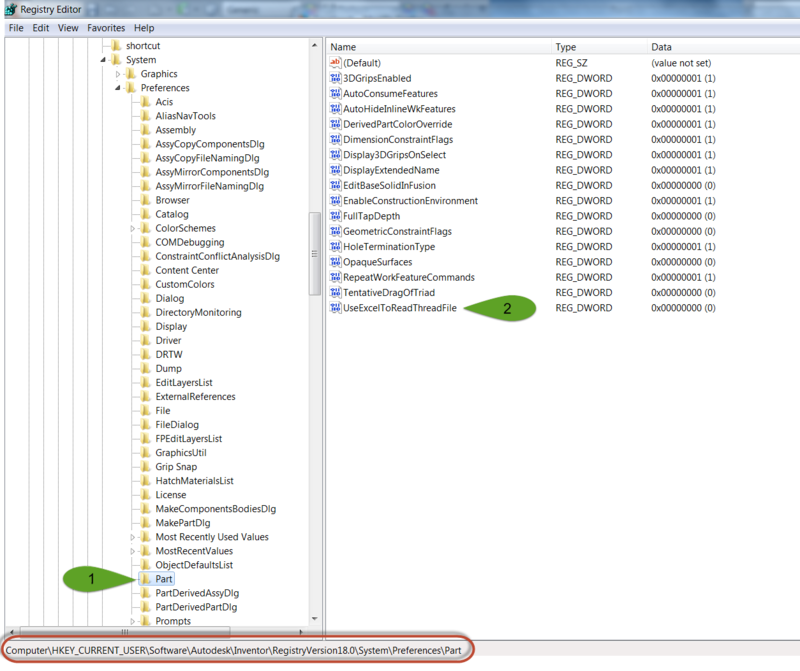 It states that there was an issue with Windows updates on Inventor versions older than 2016. I'm happy to help you out! I'm sorry to hear that you lost all that time. But I am glad that I could be part of the community that helped salvage some of that time! I'm glad this fixed the issue! It really got a lot of people! Hi I'm tried the same but still showing same problems.. I had a couple of machines in my install base that required that I change the setting twice to ensure it "stuck". I'm not sure why. I'd double check the setting to make sure it hasn't flipped back to "0". You might also try removing the Windows update that caused the issue. I ran into the same problem today.This solution worked great. It's a weird one! Apparently it was caused by a Windows update this time. It affects versions 2016 and older, according to Autodesk. It got my production version of 2015, but left my test version of 2018 alone. I noticed that the initial load of the thread data after I changed the registry took a little bit. But after that was done it worked fine. We're using Inventor 2015 where I am. I'm happy this post helped you! Thanks for your solution. This solution successfully solved my problem. You're welcome! I'm glad this post was able to help you fix the issue! ME FUNCIONO EXCELENTE COMPY , GRACIAS POR COMPARTIR !!! Obrigada por compartilhar! Resolveu o meu problema! Many thanks, still a very current issue. You're welcome! I'm glad this tip got you up and running again! ¡¡ eres un genio Jonathan, Muchas gracias por tu generosidad. Your welcome! I'm happy to help! Worked for me also. Helped me to fix and keep working in Inventor. That's exactly my setup! I'm glad I could help you out! Thanks to whomever came up with this fix Just cursed my 2014 Pro. Registry change seems to have fixed....until MS plays with it again. JD Mather shared it on the Autodesk Discussion Groups. I passed it a long here. I'm glad it's helped others. I'm still fixing the odd computer at my current job. 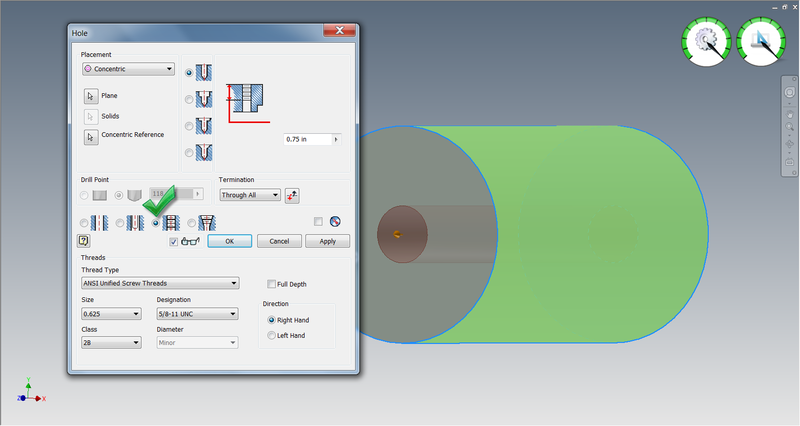 This just solved another one for me today for Inventor 2014. Thanks Jonathan! I currently have this same issue with my 2015 version and I am unable to resolve it with this steps. Any further help? I'd suggest double checking the registry and making sure the setting "stuck". I had a couple of machines at work that changed back to "0" after being set to "1". I had to set it again to show them I was serious. Another idea is to try restoring your thread.xls. Just in case the Excel file got corrupted somehow. Thanks for helping to solve this. Without thread the my constructions fell apart. I'm happy I could help you, Peter! Not being able to place threads is no fun! You're very welcome. I'm happy I could help you! Thank you Jonathan,I could Solve the problem, very helpfull your sharing. Many thanks Jonathan. the solution correct , helpfull . I'm glad this post was able to help you! You're welcome, Vo! I'm happy I'm able to help you out! It may be a different issue entirely, it affected older versions of Inventor. Do you have Excel installed.